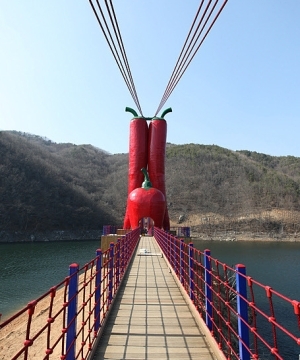 칠갑산 천정호에 있는 160m 다리는 가히 엽기적이라 할 만한 주탑모양을 가지고 있는데 이 지역의 명물인 고추와 구지자를 형상화했다고 한다. This entry was posted in 한국의 교량 and tagged suspension, weird. Bookmark the permalink. Post a comment or leave a trackback: Trackback URL.